FILE - President Donald Trump speaks during a meeting in the Oval Office of the White House in Washington, Jan. 31, 2019. "The Democrats do not want us to detain, or send back, criminal aliens!" Trump said on Twitter. "This is a brand new demand. Crazy!" While the dispute initially centered on Trump's demand for $5.7 billion to build a wall along part of the U.S.-Mexican border, the negotiations have foundered on a Democratic effort to limit the number of undocumented immigrants apprehended within the United States, not at the border, who can be detained by U.S. immigration authorities. Democrats are trying to curb the Trump administration's aggressive detention tactics. They want to cap the number of detainees at 16,500, about the number who were held in the last years of the administration of Trump's predecessor, former president Barack Obama, although the number has risen under Trump. 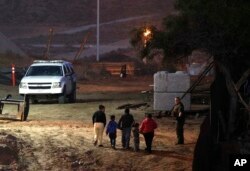 FILE - Migrants traveling with children walk up a hill to a waiting U.S. Border Patrol agent just inside San Ysidro, California, after climbing over the border wall from Playas de Tijuana, Mexico, Dec. 3, 2018. A cap on the number of beds available for detained immigrants would force the Trump administration "to prioritize deportations for criminals and people who pose real security threats, not law-abiding citizens who are contributing to our country," said Congresswoman Lucille Roybal-Allard, a California Democrat who is among the 17 lawmakers on a negotiating panel trying to reach agreement on border security funding. Democrats have offered some funding - perhaps about $2 billion - for Trump's border wall, far less than he wants. On Sunday, Sen. Richard Shelby of Alabama, the lead Republican on the 17-member congressional border security panel, told Fox News, "I think the talks are stalled right now. I'm not confident we're going to get there." When the five-week closure ended last month, the bipartisan border security group was created to hammer out details of what border security operations would be funded and how much money would go toward Trump's demand for a wall, perhaps his most popular pledge from his successful 2016 campaign for the White House. Democrats initially offered no funding for a wall, but now lawmakers familiar with the negotiations say Trump's opponents appear ready to agree to some border barrier funding, along with provisions for heightened controls at ports of entry to thwart drug smuggling and increased use of drones and other technology to try to halt illegal entry into the country.